We know that choosing the right degree can be daunting, whether it’s learning about the difference between degree courses, the associated career opportunities or the extent to which you might specialise during your degree. If you are undecided about a specific course to study then our broad-based degree courses are designed to provide you with a broad foundation as a scientist. In the second and final years, you can either retain this broad approach or specialise. For example, you might choose Medical Sciences and then transfer to Neuroscience. Or you might decide to stick with a more generalist field. Alternatively, you may wish to study in a specialist area from the outset. 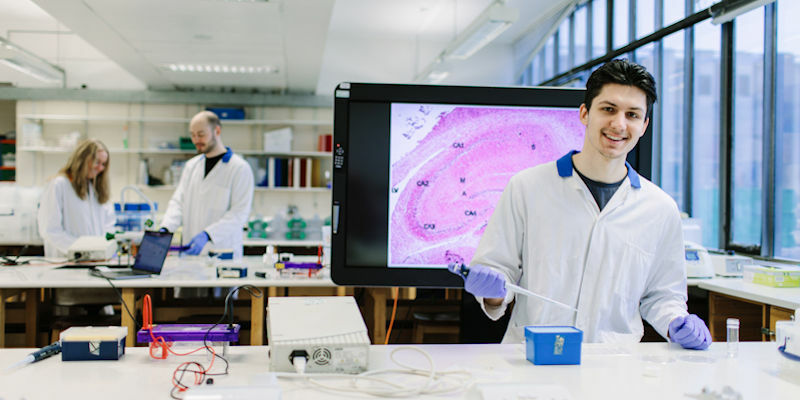 We offer an array of degree courses ranging from broad-based degrees in Medical Sciences, Biological Sciences and Biology to specialist degrees such as Sport and Exercise Sciences, Neuroscience, Biochemistry or Genetics. All our courses are designed to provide choice and flexibility to transfer between degree courses after your first year of study. All of our courses have a flexible structure. You have the option of studying for a BSc or MBiol degree and the opportunity to spend a year studying abroad or undertaking an industrial placement.